As far as careers in Finance go, Investment Banking Analyst job is one of the most rewarding choices. Apart from the fact that it’s a sure and easy way to a very successful career, it involves being creative about finding the right financial solutions and providing high-quality advice on mergers, acquisitions, and high-risk transactions. If you’re thinking about going down this road, you couldn’t have made a better and more difficult choice. Here is a short guide to everything you need to know about this position, including job descriptions at every level, salaries, and requirements for application. What Does an Investment Bank do? What does an investment banking analyst do? How much does an investment banking analyst earn? What you need to know about an entry level investment analyst job? An Investment Bank or an IB, how you will find it referenced to in most field related research material, is a financial intermediary. This means that it’s employed to prepare and secure a variety of complex financial transactions between two or more parties. Some of them focus on particular sectors of business, but most offer a complete palette of services. They can also operate for very small or even individual customers, should the need arise. Here are some of the major functions an IB holds, broken down for more details. As an aspiring Investment Banker, bear in mind that these are general functions, and they will not be necessarily shared by all IBs. Raising capital and handling underwriting security – As previously stated, an IB will always act as an intermediary between a certain company that is issuing securities and other parties interested in buying them. The IB will help assess the value of the securities so that they can be sold as profitably as possible. Also, the bank will perform some risk management for the business, so that they can price, underwrite and sell the issuing securities. Mergers and acquisitions – An IB can give advice to its clients about the transactions they make, including negotiating, pricing and structuring. They can also help them build a process as far as mergers and acquisitions are concerned and then implement it. Sales, trading, and equities –This category of actions refers to the fact that Investment Banks create a link between buyers and sellers. They also buy and sell securities all on their own. In this way, they facilitate security trading. Retail and commercial banking – The Glass-Steagall repeal happened in 1999 and, after that, investment banks were prompted to offer more traditional services, such as off-line commercial banking. Front and back office – Investment Banks offer both front office and back office services. The former include M&A advice and the latter include risk management, corporate treasury, strategy, compliance, controlling the finances, technology and operations. These are all critical functions and services. History of the business – This might sound redundant, but it’s actually a very important service. Since the Panic of 1907, when J P Morgan had to personally step in and bail the United States out, many Investment Banks have taken to surveying the industry. They do this to make sure nothing like that financial crisis happens ever again. Now that we’ve covered the grounds on what the bank in itself does, let’s plunge into the job of the banker. This set of information will help you decide if this is indeed the line of work for you and if you have the necessary education and requirements. Also, it will give you an insight as to what the different stages and departments of the job are. Simply put, an investment banker assists its clients, both public and private corporations, in raising funds in the capital market. Also, he or she will provide crucial advice to his clients about mergers and acquisitions, strategic movements, and all sorts of financial transactions. Use their expertise to tell companies what would the best strategy be when they want to raise their debt or their equity capital. Since most companies don’t have the in-house knowledge to do this, they must find a third party that can help them. In this way, they save a lot more money and time than if they created their strategic department. They prepare all the paperwork. To prove that a certain financial strategy is good or not, investment bankers need to prepare presentations and reports that factually state the reasons behind their choice. They need to steer the company clear of any misunderstandings. Also, they need to assess the costs and plan them according to the company’s budget. All the top IBs prepare what is called a private placement memorandum, or a PPM. This is a legal document, meant to protect both the company and its investor from taking shady routes. They need to make sure that all legal requirements are met. Raising capital needs to be done in ways that comply with the law, needless to say. And it’s the Investment Banker’s job to make sure neither party is on the wrong side of the tracks should the IRS decide to chime in. This particular part of the job is extremely important. The reason is that, when raising capital, companies usually break laws they didn’t even know existed to begin with. This might come back to haunt them if the banker is not on top of things at all times. It’s normal for the wages to be high, given all that we explained above. It’s a difficult job, with a lot of pressure and responsibility placed on the banker’s shoulders, especially if he’s working on big accounts. Therefore, his salary should match his work and his performances. Starting from 2013, salaries for an assistant or junior investment banker with a business degree range from $100 000 to $150 000 after bonus. The starting salary, as offered by most investment banks in New York City, for example, comes down to $75 000. And you also get a $15 000 or $20 000 bonus for signing. This means that you’re looking at a cool $8000 a month, as a beginner. You can also receive further bonuses. Depending on your personal performance, they range from $20 000 to $40 000. Education matters most because you get paid according to that as well. An MBA degree in your CV will secure you a salary that ranges between $120 000 and $220 000, after bonus. However, you need to know that this is just an average. Wages do depend on the state and even region you’re working in. College degrees are very important. Usually, investment banks hire people with business degrees, so make sure to choose the right college if you want to pursue this career. When you enter in a bank, freshly out of college, your job will be Analyst or Financial Analyst. You need to spend two or three years in this position before you can leave to get and MBA, or before you can get promoted to But seeing as you need an MBA to be promoted to Associate, you will most likely leave to complete your education. It’s a very tricky job to get. As stated above, it’s very difficult, it’s risky, and you need to be really good to simply get in, not to mention getting promoted. There are less than 20 000 job opening per annum for Junior Analysts. This is bad news because the pool of applicants is 5 to 10 times larger. Also, the applicants pool is very high quality. This translates the hiring process into selecting the best of the best. Do not base your future job prospects on big companies coming to select applicants from colleges. This doesn’t even happen for Ivy League schools. Therefore, you need to apply for jobs yourself. As many and as often as possible. Do not waste too much time on the Internet. The best part of jobs is not advertised at all. You need to understand this is a very closed arena. They don’t find the need to advertise since applicants come knocking at their doors in droves. However, you can use the Bloomberg machine, for its job board area, the New York Times classifieds and sites such as Indeed. Always be prepared for an intelligent conversation. This means learning as much as possible about your possible employer’s line of work. Be it technology or telecommunications, you need to know everything about it. Be presentable and well dressed. Smile and make a few jokes, to show them that you will be able to connect to their clients on a personal level. Befriending people is the best way to attract new business. If you don’t know something, say it. Don’t babble and do not make up things. They will appreciate an honest answer, formulated as follows: “I don’t know how to answer this question, but I know (insert field literature source) has a piece on it. I must read it as soon as possible”. This will show them you are honest and that, even though you don’t have a specific piece of information, you know where to find it. 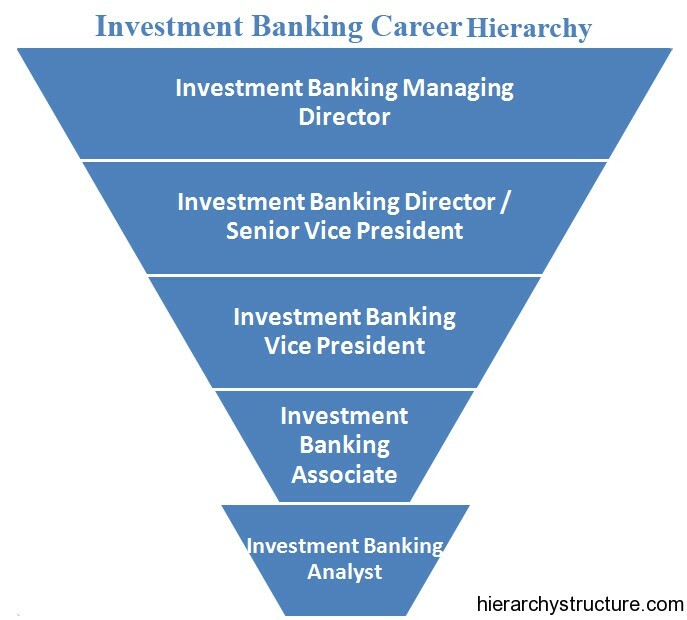 As shown above, an investment banker reaches this position after he or she has spent a few years as a junior or analyst. Also, you need an MBA to be promoted or to be hired directly into this position. Let’s see what being an associate means. First and foremost, when you become an associate, you need to know that you are in. This is when the game starts. Because you will have to prove yourself. You must know how to do DCF valuations. You must be a true master of Excel. You need to be able to get clients to meet with you. This might sound easy, but it implies some out of the ordinary communication and people skills. You must be able to do business with very important people. They have been described as having enormous egos and being difficult to please. Prepare documents and paperwork on debt and deals regarding equities. Preparing pitch books should become your second nature. You need to understand the psychological part of your job. Remember that it’s not easy. Otherwise anybody could do it. You will be faced with a chaotic environment. It will be stressful, and you will be working very long hours. Always take an initiative. Come up with ideas and be pro-active. After all, it’s your job to solve financial problems for your clients. And this is why you shouldn’t wait for them to ask you for a solution. Networking is crucial. Remember that, if you are good, you will only spend a few years as an associate. The next step is having your clients and initiating your deals. This is why, while still working under your boss, network as much as possible, prospect the maker early on and make friends. Private equity analyst or PE is one of the paths you can choose while working as an investment banker. He or she is the person who does the research and analysis on private companies. Therefore, if this sounds like something you are interested in, here are the basics. As the name suggests, you will be working with private equity firms, trying to determine if it’s worth it or not to invest in stocks belonging to a certain company. You will be performing financial modeling, and you will be evaluating the companies your clients want to invest in. As far as evaluating the companies go, there are two techniques being used today: Discounted Cash Flow (DCF) and Internal Rate of Return (IRR). You will need to get yourself familiarized with both of them. It’s a very risky job. The main reason is that there are no fixed criteria through which the stock value of a certain company can be determined. This means you will have to use your own sense of foretelling and judgment when you make a recommendation. Your main objective is to maximize your client company’s investment portfolio. When you make a recommendation, you will need to build a detailed review of the financial statements of the company being considered. You will also have to review all the potential new private equity investment opportunities. Another path you can choose apart from the private equity one is a venture capital analyst job. Here is what you need to know about this job. Usually, people in this position come from the following backgrounds: corporate or consulting, because they will know how to run all the operations, entrepreneurial because they have experience in starting a new business and finance, because they know how to manage investments. Most VCs say they spend their day researching and doing due diligence for the deals they currently have and are active. They also have meetings entrepreneurs and portfolio companies. They try to do as much networking as they can, by participating in conferences and other such events. Helping the company’s existing portfolio with projects. You can either be proactive and come up with your own, or you can work on existing ones. Organizing all sorts of community events, where you can represent your company, your boss or do heavy networking. Here is your beginner’s guide to being an Investment Banker. So, what does an Investment Banker do? He analyzes of course, would be the simplest answer. However, you may have noticed what a complicated and difficult world investment banking is. It’s very tough to get in, as you need to have a business degree and competitive skills. And when you do get in, that’s where the hard part starts, as you need to run the game. But the rewards are so high when the time comes to reap them, that it’s all worth it in the end. Do you conduct financial modeling classes in Mumbai as well ? Not, at this moment. Planning to start this year. Please check all videos on our YouTube channel. If your long-term goal is I-Banking, then it would be good if you work in core financial research and analysis KPO where the work is Analysis oriented rather than Process oriented. Eclerx work is more Process oriented.